He secured £70 million for affordable homes in Cambridge, and now Kevin Price is setting his sights on sorting out Peterborough’s own housing problems. The Cambridge City Council deputy leader and executive councillor for housing was a key player in bringing devolution to Cambridgeshire, with the final deal including a bumper amount of government funding for his home city. The Labour politician is now promising to “fight the corner” for the rest of the county if he is elected as its first mayor in early May. He said: “Unless people have decent, genuinely affordable housing, their lives are made more difficult. I would be looking to things that they are looking to do in Manchester, defining affordable as no more than a third of annual income so that the cost of renting is no more than that. Peterborough, he says, needs around 1,000 homes a year to be built, which will include those in the private sector. The majority, though, should be “genuinely affordable housing,” according to Mr Price. These are “for people who can’t afford to buy or can’t afford to rent privately. Peterborough City Council is a member of a new combined authority which will be led by the mayor and will include representatives from the other six main Cambridgeshire councils and the Greater Cambridge Greater Peterborough Enterprise Partnership. The combined authority will receive £170 million from the Government to spend on housing across the county, with £70 million of it guaranteed for Cambridge after it demanded the money in return for agreeing to devolution. Mr Price said: “I played quite a key role in the negotiations for the money for housing, in particular the amount ringfenced for Cambridge City Council. Asked how he will persuade people that Peterborough will not be left behind from devolution, and that the city will benefit from it, Mr Price answered: “It’s difficult because that £70 million sits there, but that was Cambridge looking after Cambridge in order to come to the table if you like. “I think it will be hugely important to ensure that Peterborough does get its share, and as mayor I will want to make sure things are shared out. However, he added: “I think whoever is going to be the mayor is going to have learn different things from everywhere in the combined authority. The major issues in the city, he believes, are homelessness and affordable housing. Asked for his views on the Bridge Street cycling ban, Mr Price admits he is not aware of it, but said: “Cambridge city did that 20 odd years ago, a ban on cycling in the centre of the city. It didn’t work then. Mr Price is a porter at Clare College, Cambridge, which he believes helps him to stand out from the rest of the mayoral candidates. He said: “You get somebody that has an understanding of how people actually live. I’m a printer by trade, I did that for 32 years. I’m now a college porter, something I’ve done for the last 10 years, and I currently earn 40 per cent of what the people in Cambridge earn, less than £22,000 in my day job. “I understand what it is that people want out of how to live on a not particularly high income. It gives me a very good grounding and understanding of what ordinary life is like. 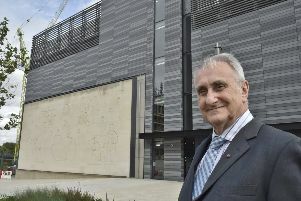 Having helped to negotiate the devolution deal for Cambridgeshire, which set up the role of mayor, Mr Price believes he has shown he is the right man to take on the challenge of improving the county in the next four years. He said: “I would see the mayor’s role as finding out, discussing, talking with all the leaders of the combined authority. It’s the mayor’s role to then knock on the Treasury’s door and tell them what we need to do what we’ve been charged with doing. “I’m perfectly willing, and have done so already, to tell ministers when I think they are wrong, if I think what’s on offer is not good enough. “That’s where the £70 million [housing money] for Cambridge city came from. “At that particular time it was me and [city council leader] Lewis Herbert fighting Cambridge’s corner. It was a line that we drew in the sand - that was what we wanted in order for this to work. A key policy area for the new combined authority and mayor will be transport. Mr Price wants to improve rail links within the county, but a main pledge is for the authority to run its own bus service. Winning in Cambridgeshire will be a huge challenge for any non-Conservative candidate, but there was plenty of conviction from Mr Price when asked if he was confident of a surprise victory. “I’m absolutely confident I can win,” he added, “because I think as we go forward, we will get the message out that if people want a mayor who will stand up for this combined authority area then it needs to be a Labour mayor who will stand up to a Conservative government in the way I don’t believe a Conservative mayor will.